I assume that immigration lawyers don’t have many would-be immigrants calling up to say “I want to get a CR1 visa. Please help me find a wife.” People understand that marriage and immigration are separate issues. Of course the lawyer who handles your paperwork doesn’t also help you fall in love. The CR1 relative visa grants you benefits based on a relationship that you have entered into, but the marriage decision is obviously separate from and prior to the immigration process. When all this is clear for an immigrant spouse, why do immigrant investors get confused? Immigration lawyers do often hear the request “I want to get an EB-5 visa. Please help me find an investment.” Apparently many people do not understand that, in the US, the investment decision and the immigration decision are separate. The lawyer who handles your immigration paperwork is not placed or qualified to select a good investment for you. Neither is USCIS. The EB-5 visa grants you benefits based on an investment decision that you have made, and that decision involves factors that are separate from immigration considerations. Potential immigrant investors, take note! Investing half a million or a million dollars is a serious matter in itself, just as getting married is a serious matter in itself. These are not fundamentally immigration matters, even when they provide a basis for a visa later. Get advice from people who know about investing or who know about marriage. Go on lots of dates, talk about everything, meet the family, see a marriage counselor. Research the investment opportunity and the principals and get qualified investment advice. If you skip all that and just focus on immigration, you’re missing the point and are very vulnerable to getting hurt by your marriage or by your investment decision. The news this week reminds us of what can happen. See the SEC’s notice “SEC Charges L.A.-Based Immigration Attorneys With Defrauding Investors Seeking U.S. Residency” and a more detailed article in the local news “Three charged by SEC in western Kan. ethanol scheme.” It’s hard to tell whether this started out a fraud or just as incompetence/bad luck that spiraled into fraud, but either way I don’t think this could have happened if the victims involved had recognized that EB-5 investment decisions require serious attention and diligence, and that one should not depend on immigration consultants to advise on much less to manage investments. At the same time, the perpetrators might not have dared so much had they taken the investment angle of EB-5 seriously. Maybe the perpetrators thought that EB-5 is just an immigration program and they were free to do what they wanted so long as not caught by USCIS review. Now the heavy hand of the Securities and Exchange Commission is on them, reminding them that EB-5 investments are investments and regulated and policed as such, regardless of the immigration angle. 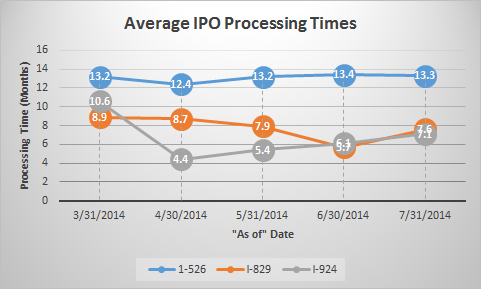 In other news, IPO processing times have been updated on the USCIS Processing Time Information page, with little change since last update.